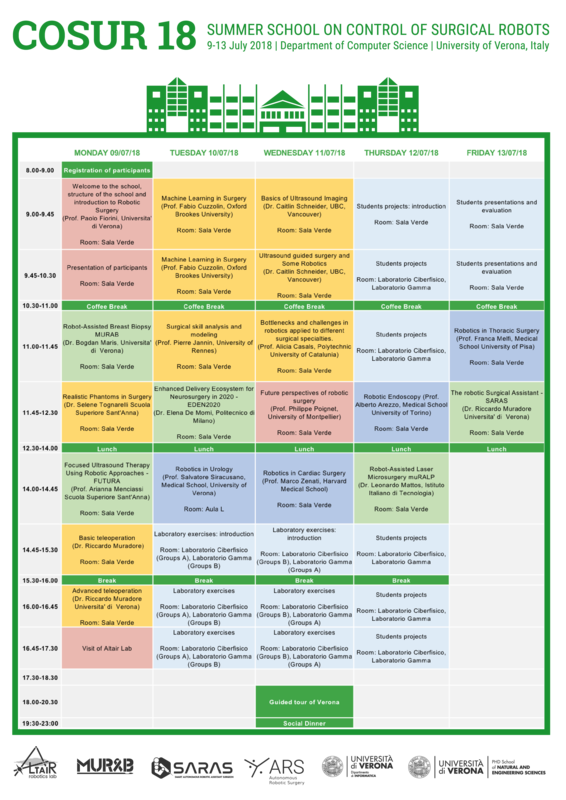 Organized by ALTAIR Robotics laboratory in collaboration with the Horizon 2020 projects ARS and SARAS. 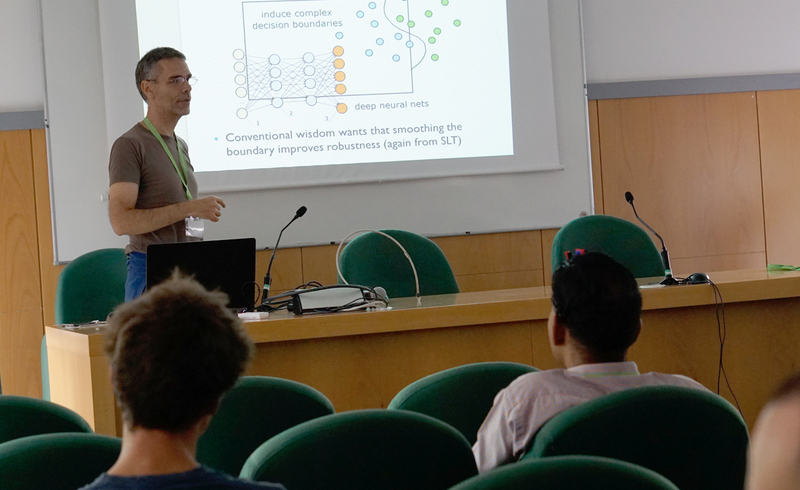 26 attendees and 16 speakers from mostly all continents met in Verona to attend COSUR 2018, second edition of the biannual Doctoral School on Control of Surgical Robots (COSUR). 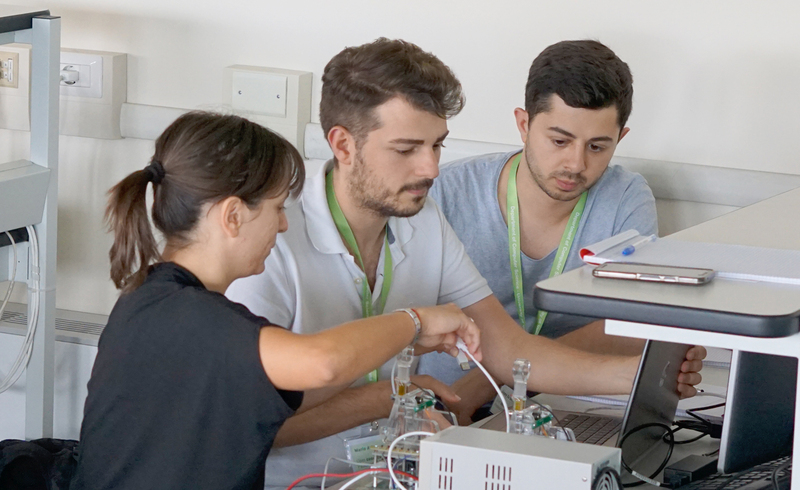 During the week of 9 to 13 July 2018, 26 attendees and 16 speakers from mostly all continents met in Verona to attend COSUR 2018, second edition of the biannual Summer School on Control of Surgical Robots organized by ALTAIR Robotics laboratory in collaboration with the Horizon 2020 projects ARS (Autonomous Robotic Surgery) and SARAS (Smart Autonomous Robotic Assistant Surgeon). 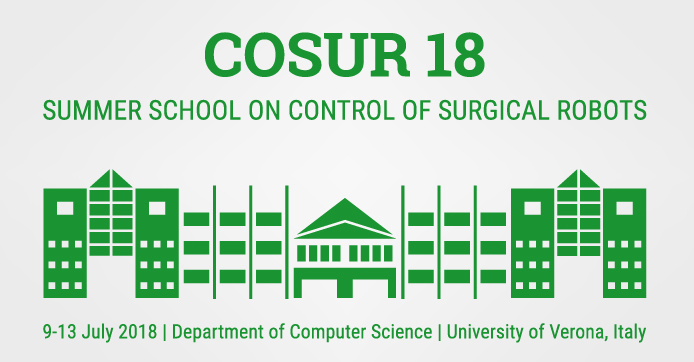 The aim of COSUR is to introduce students to the multidisciplinary research field of surgical robotics, with particular focus on the control algorithms used in robotic surgery and the impact of cognition in directing the control. 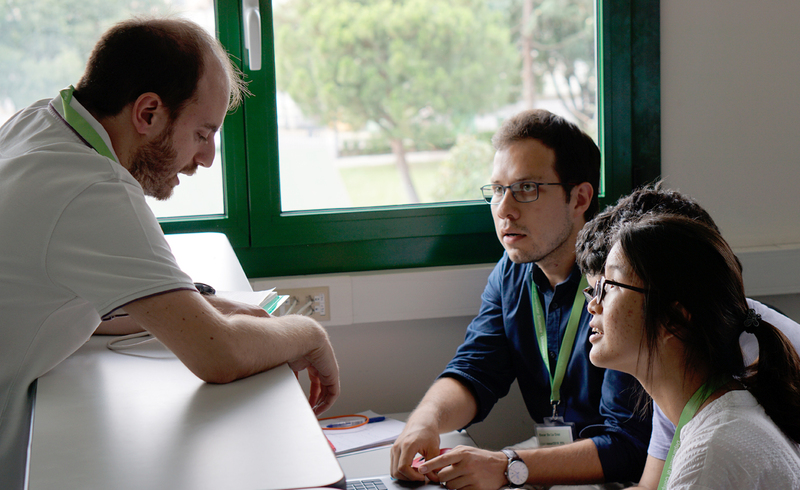 The school attendees included PhD students and Post-Doctoral fellows with different academic backgrounds and qualifications, from computer science, to engineering and to medicine, and they had the opportunity to learn from well known lecturers and work together at group projects in a nice and friendly atmosphere. The School program was organized in four different tracks: technical, medical, project and laboratories. The medical lectures were given by some of the leading specialists in Robotic Surgery: Prof. Franca Melfi – from the Medical School University in Pisa, expert in Thoracic Surgery, Prof. Marco Zenati from Harvard Medical School, pioneer in Cardiac Surgery, Prof. Alberto Arezzo of the University of Torino, endoluminal surgeon, and Prof. Salvatore Siracusano, the leading urologist of the University of Verona. Not only well-known clinicians but also young researchers contributed to COSUR lectures, as Dr. Caitlin Schneider from UBC Vancouver, expert in medical imaging. 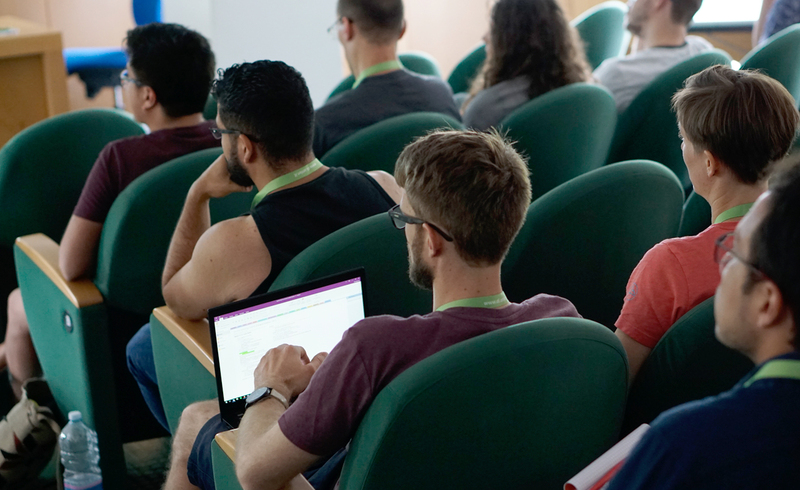 The technical lectures were given by some of the best-known researchers in Robotic surgery, such as: Prof. Alicia Casals from Polytechnic University of Catalunia, Prof. Arianna Menciassi from Scuola Superiore Sant’Anna and Prof. Philippe Poignet from the University of Montpellier. 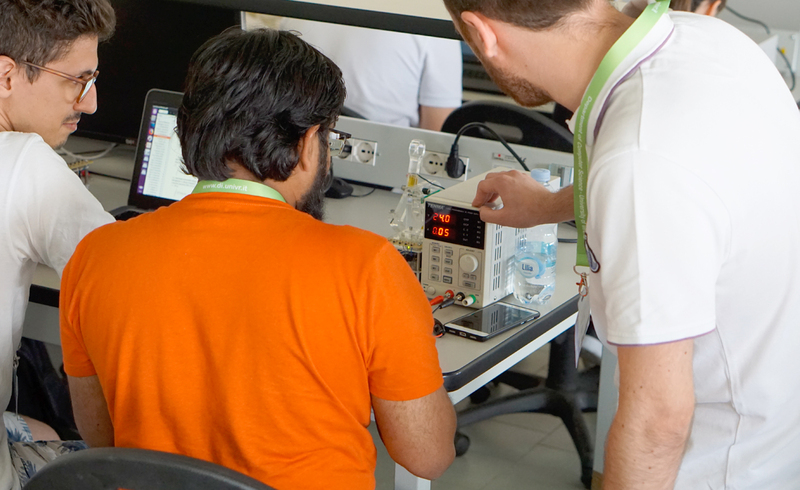 The laboratory sessions were focused on teleoperation and machine learning and students worked in small groups to foster collaboration and cross fertilization. The results were presented and evaluated during the last day of school. In addition to the study program students had the opportunity to discover Verona on a guided tour of the historical center where they experienced the beauty of the city of Romeo and Juliet and moreover enjoyed Italian food at the traditional social dinner. 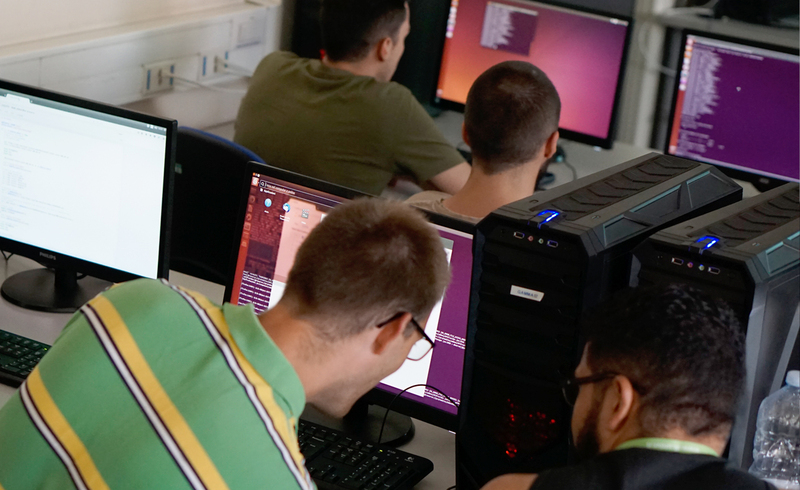 The school is funded by the ARS project, the SARAS projects, the MURAB project, the Doctoral Program in Natural Sciences and Engineering, the Department of Computer Science of the University of Verona and the Robiopsy project. The next COSUR will take place in 2020. “Robotic autonomy has a clear role in the future of robotic surgery, at the same time Artificial Intelligence is often a source of misconceptions and fears because of the lack of a common framework and the small attention given to scientific communication.